The Message Smart Card gives you the ability to change certain messages on the card based on who is receiving them. A designated area on the back side is available for customization using black ink. You can change coupon offers or prices, based on things like the prospects location or if they are already a customer. (we would know this by merging your database with our mailing list) You might highlight different services based on the age or income of the recipient. 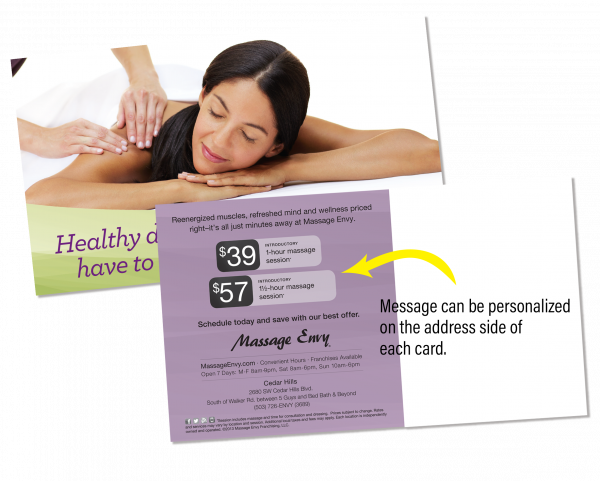 There are numerous uses for this capability that help you personalize the card to the relevant interests of the person receiving it. Most importantly, anytime you personalize a mailing, response rates will go up. Our variable postcard is a lot like the postcards you are already receiving in your mail, but our Variable Smart Card has a great advantage that will impact your business at a distinct saving. Working as an official partner of the US Post Office, our mailing costs are among the lowest in the country. Coupled with our data analysis service, we are able to target the markets with the best potential customers for your business. Don’t buy leads and lists off the internet, our lists are continually updated and recipients are targeted based on their past buying behaviors. Personalization includes details that attract customers. Our unlimited access to national data provides information including over 100 million households, including age, ethnicity, buying behaviors, health and wellness, financials, and real estate. 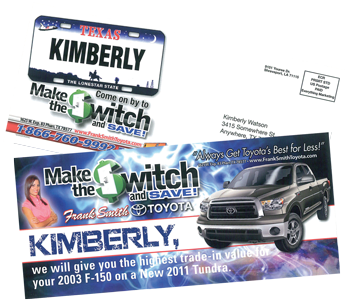 This information combined with our unique, personalized postcards, allow us to target and deliver database driven direct mail products more accurately and efficiently. The Power of Frequency – In today’s crowded media landscape, it takes time for consumers to truly see your ads. Here’s why. With your first ad, you laid a foundation for future results, but only after repeated impressions does your message and branding fully stick in the minds of your target audience and deliver the desired results. Want to Raise the Bar More? Our Highly Visible Variable Smart Card Delivers Results! Maximize Your Marketing Dollars by Targeting the Right Audience. The Variable Smart Card works for every business with a vibrant image and an eye-catching message, it stands out from all other mail in the mailbox.